Rajpura, February 8 Four persons were killed and four others received serious injuries in two different accidents here this morning. 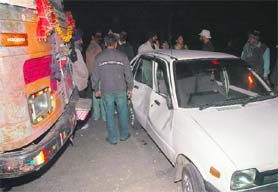 The dead were identified as Chandigarh resident Amaninder Singh and his driver Jasvir Singh, who were in a car and met with an accident at Gagan Chowk. Even as the common man has to run from pillar to post to get an FIR registered, many investigators are hunting for the lost dog of the SHO of Banur without registering an FIR or a formal complaint. The move for granting three months’ extension to Dr SK Bhandari, joint medical superintendent at Government Multi-Speciality Hospital, Sector 16, has finally come to an end as the UT Administrator, Gen SF Rodrigues (Retd), has approved his superannuation on scheduled date. Hic, hic ... not hurray! 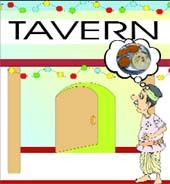 It’s been over a year, but the Rs 25 “dream” meal promised to Bacchus lovers in the city’s taverns still remains elusive. In August 2007, the UT excise department had issued mandatory guidelines to all tavern licencees to provide meal (dal and four chapattis) at a subsidised rate of Rs 25, but no one seems to be following the directive. Anuradha Bali (now Fiza), wife of former Haryana Deputy Chief Minister Chand Mohammad, today extended the time limit by four or five days of the ultimatum she gave to her “missing” husband to make his stand clear on their matrimonial status, failing which legal action will be taken against him. The OPD of the Postgraduate Institute of Medical Research (PGI) will remain closed on Monday on account of Guru Ravidas Jayanti. Controversial mega projects continue to be the nightmare for the Chandigarh Administration. Close on the heels of the Central Vigilance Commission (CVC) starting an inquiry into these projects, an application has been moved in the Punjab and Haryana High Court for initiating the contempt of court proceedings against senior functionaries of the Chandigarh Administration. Humbug all, believe it or not! I must confess that in my bid to sometimes add optimism in my columns, even when things around us are unmistakably going from bad to worse, I often use the word "seem" to avoid a categorical statement. For instance in my column, "We and are law enforcers" (Dec 22, 08), I wrote, "I don't want to sound cynical but it seems that human life comes cheap in our country". The colour and vibrancy of the country’s varied cultural heritage came alive at the National Folk Dance Festival which entertained audience for the second day here last evening. The worldwide cooperative movement could be the bulwark for a recession-hit capitalist economy as good business practices in cooperatives have cushioned their members from the present global economic meltdown. This was stated by Ivano Berberini, president, International Cooperative Alliance (ICA), who is here to attend a national conference on “Revival of Rural Cooperative Credit Structure” starting tomorrow. The heads of civic bodies of the tricity have decided to join hands in an effort to come over the problems where the interests of the residents are shared. To take a note on the current situation and the problems seem to come across the residents of the region, the Mayor of Chandigarh will held a meeting with her counterparts at Panchkula and Mohali tomorrow. Contrary to the general perception that organ donation is possible only after brain death, PGI doctors stressed the fact that its possible to take out the organs even after the cardiac arrest. When it comes to comply with mandatory fire safety norms, the city coaching centres, which otherwise promise 100 per cent success at any exam, seem to have failed badly. Confusion prevails in the MC over the status of those employees who have come from the administration on deputation. According to a notification issued by the UT administration, until the time these employees are merged with the corporation, their status remains that of foreign service. Cable thieves are striking at will to steal cables from the BSNL at ducts in the city. As the BSNL is losing several lakh of rupees in theft and then restoration of the cables, the thieves have been repeatedly stealing the cables from the same points in the town. The BSNL officials accuse the local police of doing little in tracking down the thieves. Even as PGI medical technologists seem adamant and are all set to strike work for two hours on February 10 and 16, the hospital authorities claim that all “genuine” demands of the agitating technicians had been met. Despite the global crude prices having hit a record low, the state-run oil marketing company — Bharat Petroleum Corporation Ltd (BPCL) — has failed to bring down the price of their premium fuels. Though the price of the normal fuel (both petrol and diesel) was reduced on January 29, the oil marketing company has failed to bring down the price of its premium fuels. Culture is an ever-evolving phenomenon and cannot be held to ransom by the whims and fancies of a select few. The recent attempt by Bapu Asaram and his followers to advise young couples of the city to shun western culture by not celebrating Valentine’s Day has evoked strong reactions across various sections of society. IFFCO-TOKIO general insurance has opened the first Insurance Regulatory and Development Authority (IRDA)-accredited Agents Training Centre at their Chandigarh office. This is the first in-house training centre opened by any private General Insurer in the country. Festive folk dances and bonanza of folk songs, old classics and ghazals marked the celebration of Basant Utsav by the Senior Citizens’ Council at the Council Hall here today. Shortage of power has become a permanent feature for the industrial units here during the past two years and industry may face another setback if the commissioning of the Sector 80 grid substation was deferred again, said president of the Mohali Industries Association BS Anand here. Members of the Joint Action Committee (JAC) today sat on relay fast outside the office of the Greater mohali Area Development Authority (GMADA) in Sector 68 here to protest against the hike in the rates for registration of conveyance deeds of plots in Mohali. Two victims of separate road accidents today succumbed to their injuries in Sector 32 Government Medical College and Hospital, here. A Mohali-based family had a narrow escape this evening at Traffic Light Points near Centra Mall here when a truck collided with the car they were travelling in and dragged it to a distance. This is with reference to the article “Why speedy justice not a rule?" 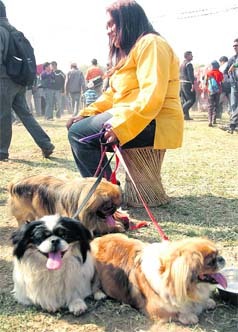 written by Raveen Thukral published in Chandigarh Tribune on February 2. Punjab Technical University (PAU) conferred its first advanced diploma certificates in industrial engineering and management on the first batch of students enrolled at the Gian Jyoti School of TQM and Entrepreneurship, Mohali. Samarbeer Kang, Saskan Mehta, Asmi Kanwar and Anand Raj Singh were adjudged as "Shemrock Healthy Babies" at a baby show organised at Shemrock School here today. 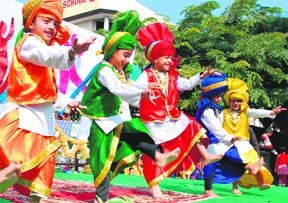 Tiny tots of the tricity showcased their talent. A splendid display of dressing sense was appreciated amid thumping beats and dazzling lights. Punjabi University will not compromise on the issue of granting any kind of relaxation to students and research scholars pursuing their studies for getting any degree from the undergraduate to the doctorate level from the university. The police arrested four youths on the charges of trespassing into office of the Times of India in Sector 8, here, and manhandling employees on Saturday night. The police arrested four persons and claimed to have seized 1,163 pirated CDs from Sector 35-C here on yesterday. Thieves decamped with valuables after breaking open windowpanes of two cars in Manimajra. 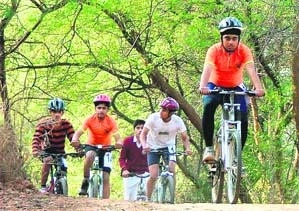 More than 40 cyclists representing different colleges and schools took part in the cycling races in boys and girls’ category being organised by the Chandigarh Amateur Cycling Association for senior, junior and sub-junior sections here at the Sukhna lake today. 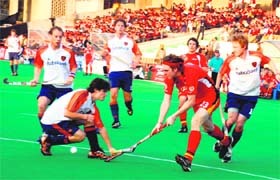 The ongoing Four-Nation Punjab Gold Cup Hockey Tournament has been a huge crowd-puller with about 15 thousand spectators everyday at Sector 42 hockey stadium here. Gaganjeet Bhullar from Kapurthala could muster a one over par 73 in the final round to finish tied 37th at four under 280 in the season opening Asian Tour International at Bangkok today.